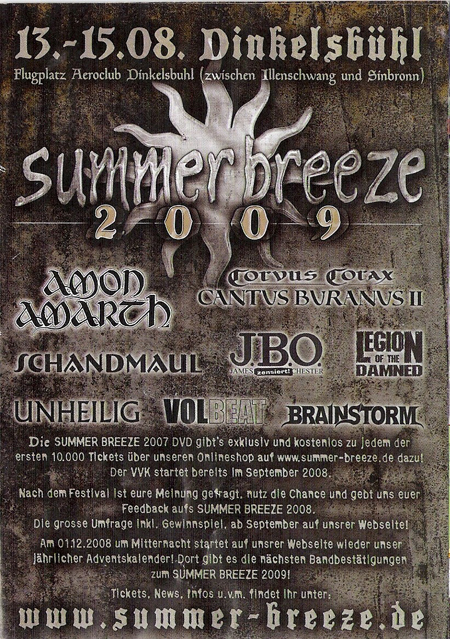 WINTERSUN, the Finnish band led by former ENSIFERUM singer Jari Mäenpää, has been confirmed for next year's installment of the Summer Breeze festival, set to take place August 13-15, 2009 in Dinkelsbühl, Germany. A poster for the event can be viewed below. Many more bands will be announced over the coming months. WINTERSUN is continuing work on its long-awaited new album, "Time", tentatively due in August 2009. Songtitles set to appear on the CD include "Sons of Winter and Stars", "Land of Snow and Sorrow", "Time", "Fire", "One with the Shadows", "Storm" and "Silver Leaves".